More and more people start to record their screen when they play in an online casino. Sometimes they broadcast it live on Twitch, or they upload it afterwards to Youtube. Thanks to those people there is a massive pile of Starburst big win video clips. Call me a slot machine geek, but when I am not playing, I do enjoy it to see other players win jackpots and big piles of cash. So I spent a couple of hours going through the big win videos on Youtube, and here is my top 5 favourite Big Wins on the Starburst slot machine. The player “Doa” was playing on the Starburst slot machine with a coin value of 20 cents. The Starburst slot has ten win lines, so every spin cost him 2 euros. Doa got lucky, and at first he gets two wild reels, and during the respin he even gets a third wild reel! He won a whooping €767, that’s 383,5 times his bet per spin! Congratulations Doa on this Super Mega Win! Not everyone can afford to bet 2 quid per spin. Bogdan was playing 3 win lines with only 1 cent per line. So every spin on the Starburst cost him only 3 cent. The amount he won doesn’t sound spectacular, but €10,25 is more than 341 times his bet. That’s something I call a big win! When you see his reels, you can only wonder how much he would have won if he would have played with all ten lines! I am not sure in which language the next guy is playing, but a win is a win! I see a lot of strange words going over my screen (could it be Swedish or Finish? ), and I understand from the numbers that he is playing on the Starburst for 1 euro per spin. He hits the three wild reels and wins a total of €243.20. That’s not as spectacular as the other video clips, but at least a very decent win! Kim let his mother play the Starburst slot, and she brings him instant luck: while she is betting 15 Swedish Krona per spin, she wins with two wild reels. First, she hits from right to left a couple of bar-symbols and during the respins she gets from left to right some nice combos with red rubies. Kim’s mother really profits from the “win-both-ways”-win lines on the Starburst video slot. In total, she wins a sweet 2325 SEK. That’s Pre-Brexit around 210 sterling, equal to 155 times her bet. The big question is now: who will drink the champagne tonight, Kim or his mother? Johnny likes to bet big, and he plays for 10 euros per spin on the Starburst. In the four-minute video clip, you maybe don’t see any Super Mega wins, but he does hit a couple of nice combos. Johnny starts his video clip with a bank roll of €780,39, and after four minutes he is up to €1412,39. 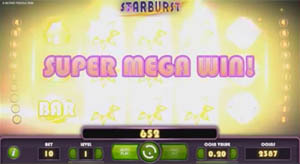 As you can see in the video clips, there are some pretty good wins to be won on the Starburst. Please check out our review, where I explain more about the features and bonus rounds of the Starburst video slot. Got inspired by the big wins? 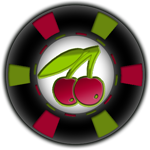 You can play this --and other NetEnt video slots-- with real money at one of the following online casinos: Unibet, Vera&John, and Royal Panda.